Cash flow is how money comes into your hands, flows through your bank account, and then goes elsewhere. It used to be that you would get a check, deposit it in your bank account, and then write out checks for your bills. Today everything is automated, so chances are you may see your salary direct deposited, then have most of your bills paid automatically such that you really don’t even see your cash at all. People who are and always will be middle class have a one-way cash flow. 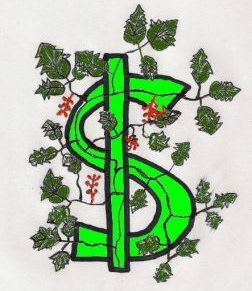 Money comes in as salary, then flows out to bills. Every once in a while there is an unusual expense, such as a car repair or a home upgrade. At that point, a loan is taken out (or a credit card is used), a new payment is created, and suddenly even more cash is flowing out each month. Left unchecked, outflows will increase up to the point where one gets into serious trouble. The cash flows of rich people, or people who will become rich, are different. They have a recirculating cash flow, where in addition to their salaries, they have income from investments coming in. A portion of their income then goes out to buy new assets, which in turn increases their income. Round and round she goes, causing income to increase until, after twenty years or so, the salary becomes insignificant compared to the investment income. Then, presto – financial independence is reached! If you want to be rich, you need to change your one-way, middle class cash flow, into a rich person’s cash flow. This needs to be done purposefully. Just as you probably won’t get where you’re going if you just get into a car and start driving, taking turns at random, you won’t get wealthy by just moving money around at random. You need a map, also known as a cash flow diagram. a) Income – this is where you list all income sources, including your salary and investment income. b) Cash on hand – this is where money briefly sits until you put it to another purpose. This could be a bank account. c) Obligated expenses – these are things you absolutely need to pay each month or they’ll throw you in jail or fine you. Things like taxes and credit card bills. d) Necessary expenses – these are things you need to pay for, like food and clothing. e) Optional expenses – these are things you could do without (luxuries). f) Required investing – this is investing that you need to do to be ready for upcoming expenses. Things like retirement investing and investing for your kid’s college. g) Saving and Investing – this is saving and investing beyond your required investments that generates additional cash flow for you. This box is how you increase your income. anything that does not go into another box should go into saving and investing, because it will either stay in your checking account or be invested into something. Reduce Box c) Obligated expenses: The best thing you can do for your cash flow is to cut back on things you are forced to pay each month. This means cutting down credit card balances (or getting rid of them entirely) so you have smaller minimum payments, getting rid of car payments by buying used cars for cash, reducing your house payment by buying a smaller house or refinancing to a lower interest rate and putting more money down (do not stretch out the term of the loan – you want to pay this off quickly), getting out of subscriptions and buying things when you need them, and getting rid of things like boats and time shares that you need to maintain whether you use them or not and renting for the day or weekend instead when desired. In general, get rid of any regular payments that you can so your money is free to use as you wish. Reduce Box e) Optional expenses: This is more of a month-to-month thing since, obviously, you pay for optional expenses as desired. Maybe instead of getting a latte every day, you just get one once a week. Or maybe you give them up for three months, build up some investing cash, then go back to them for a month. Giving up smoking would be great for your wallet, as well as your health. Cutting back on meals out is also a good way to go, instead eating meals at home or bringing something to work. Another option would be to only buy certain optional expenses out of investment income. For example, you make the decision that if you make $100 in interest during a month, then you can buy $50 worth of lattes and reinvest the other $50. Increase your interest income to $200, then you would have $100 each month for luxuries. Increase box a) Income: If you can increase your income, either through learning new skills and getting a raise or perhaps by taking on a second job or doing something on the side, you can increase your free cash flow. This is only if you won’t cause your expenses to increase as well – for example, you end up going out to eat all the time because you’re too tired to cook after work. You might also be able to do something for a short period of time to cut back on obligated expenses, like working a second job during the holidays to pay off credit card debt. You might also work extra for a short period of time to increase investment income, like delivering pizzas for a year and using the money to build up a bond portfolio so that you’ll get extra income from those bonds from then on. Reduce Box d) Necessary expense: You might be able to cut back on necessary expenses some. For example, you might look at your grocery budget and see place you can trim, or find ways to make your clothing last longer. This is not an easy place to cut, so a temporary reduction so that you can build up investing income might be the way to go. For example, maybe you cut back on clothing purchases for a year until you have a down payment for a home, then increase back to normal, or you go on a beans and rice diet for a few months while you pay off a credit card. Reduce Box f) Required investing: This would be the last thing I would touch, and then only with caution. When you are young, you should be putting away at least 10% of your income into retirement. 15% would be better. When you get to be 45 or 50, however, if you have been putting money away regularly for 20 years, you might be set for retirement and the amount you are putting away now won’t matter that much. 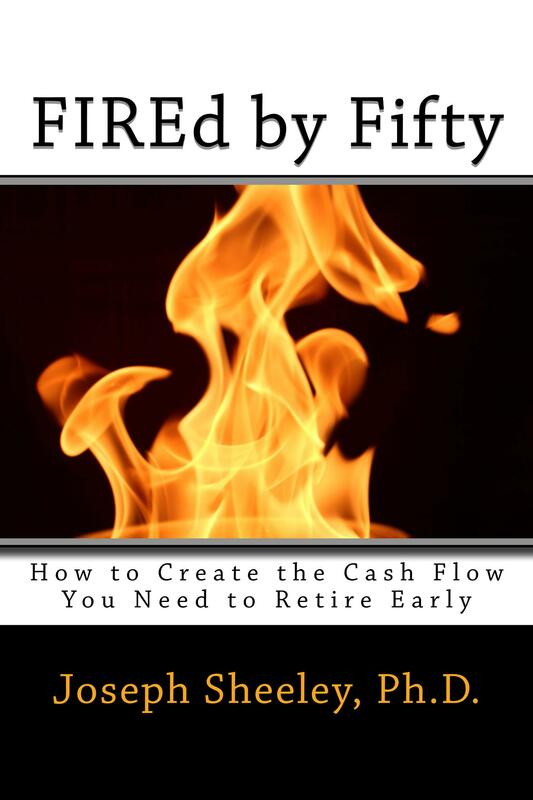 You might therefore consider cutting back on retirement savings and increase investments that increase your free cash flow so that you’ll have more security now. Plus, you’ll get to enjoy life a bit more. This would only be if you’re already set, meaning you can calculate that you’ll have way more than you’ll need in retirement if the money you have already saved and invested is left alone to grow. 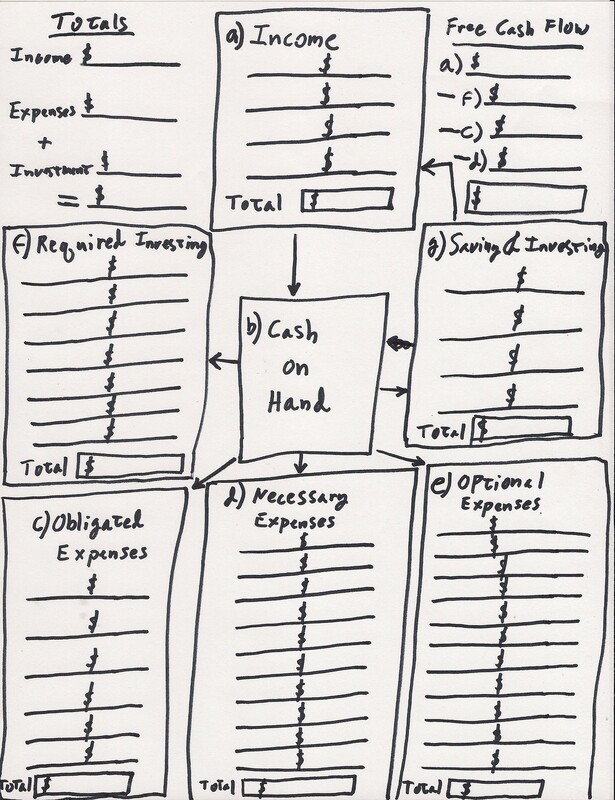 Setup a cash flow diagram yourself and see where your money is going. If you aren’t investing now, see if you can free up some cash flow and direct it into saving and optional investing. If you don’t have money going to required investments, that is the first thing you should do, right after you fill up your emergency fund. It won’t happen overnight, but I guarantee that of you setup a recirculating cash flow, you will be on the road to wealth. If you keep a one-way cash flow, no matter how much you earn, you’ll always be middle class and dependent on your job, one paycheck away from serious issues.